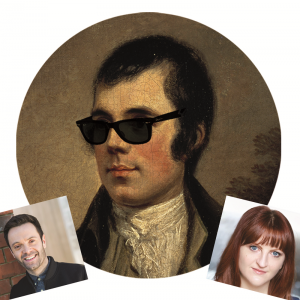 The Ghosting of Rabbie Burns – an absolute cracker of a show, just the ticket for the after Christmas blues! Heartbroken author Ariel Winters takes herself away to her aunt’s old cottage in Ayrshire to get over her cheating ex. As she celebrates Burns night alone, wishing that the right man would show up, she gets a visitation slightly different than what she’d hoped for. The ghost of Rabbie Burns appears to give her some dating advice – and he knows what he’s talking about! Featuring the great songs and poems of Burns, such as ‘My Love is Like a Red Red Rose’, ‘Ae Fond Kiss’, ‘Charlie is my Darlin’ and of course ‘Auld Lang Syne’, this hilarious new comedy proves that love and relationships haven’t changed that much in 200 years after all. Starring James Mackenzie as the lothario Burns – amongst James’ credits are as a regular in BBC’s River City, Still Game and Outlander, and Morna Young as Ariel Winters, a multi-instrumentalist and one half of the band Folkify, also a playwright, theatre maker and a Scots Language Ambassador. Both James and Morna have multiple theatre credits including the National Theatre Scotland, Dundee Rep, The Tron, The Royal Lyceum, Stellar Quines and more. Gillian Duffy, Scottish author, also writes for theatre, film and TV – upcoming is a show about Peggy Lee, a drama about the repeal of the 8th Amendment in Ireland, two TV comedy dramas based in Scotland and a film about a family’s emigration to America during Tito’s reign.